While a Google search for Zen fashion yields thousands of results that use “Zen” without any reference to its historical meaning, the Viktor & Rolf show interprets Zen fairly literally. 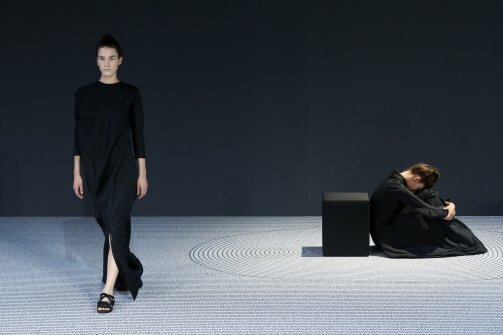 This is most apparent in the “Zen garden” aesthetic, but the designers continued the theme of minimalism in the clothes themselves, which were all black, asymmetrical, and played with volume and proportions. Their equation of Zen, Japan, nature, and minimalism undergirds the aestheticization of Zen that we see in all the “Zen and the Art of…” books, and other products that promise the aura of sophistication and exoticism. As a couture collection, this show is not for sale in the same way the designers’ ready-to-wear collection would be. Designers present couture as their high art, sewn by hand, with no two pieces the same. Women’s Wear Daily reports that an unnamed art collector already bought several pieces from Viktor & Rolf’s 2013 collection. However, designers translate themes and elements from couture shows in their ready-to-wear collections, which are mass produced and sold in retail establishments. This means that couture lines are not separate from the business of fashion, and Viktor & Rolf’s Zen couture can serve as an aspirational example that trickles down into more wearable and affordable pieces. Especially given its connection to commerce, “Zen fashion” might strike some as frivolous, a cheapening of authentic spiritual experience. 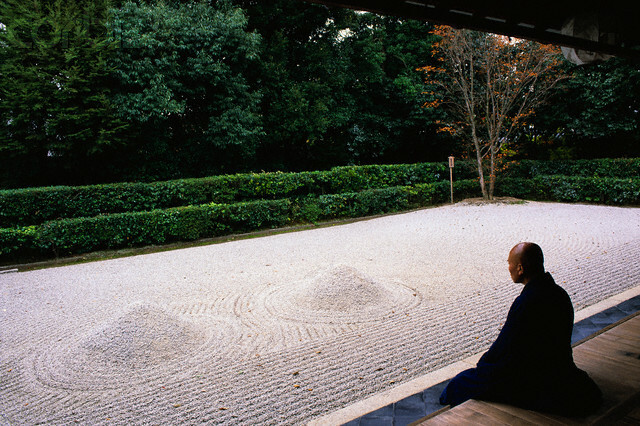 Such a view rests on the idea that Zen is essentially an interior space of mindfulness and contemplation and does not concern materiality or even ritual. One of the questions Viktor & Rolf’s collection can raise is whether Zen fashion finds historical precedent in Zen practices: after all, monks and nuns wear robes that reflect status distinctions. Robert Buswell, in his account of Korean Sŏn (Zen) monastic life, writes of monks sewing patches on their robes to make them look older, and thus enhance their ascetic reputation, which is another form of aspiration.